Before retiring in 2005, I had the good fortune to work for about 8 years on SGI/IRIX (Unix) workstations. On those workstation desktops, there was the concept of 'toolchests' by which one could startup applications. The toolchests served the same function as the 'Start' menus on PC's. The main difference in implementation on the SGI desktop is that the main toolchest started at the top-left of the screen instead of the bottom left --- and they had a different look --- an X-Motif look. 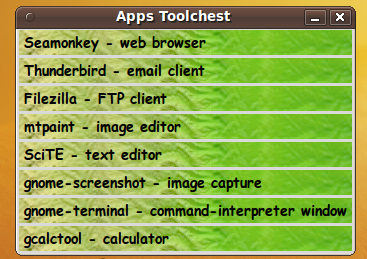 After I retired, I thought I would like to make toolchests of apps and utilities on my Linux PC's. On the SGI's, to add toolchests, one had to make text files of a certain format --- to define the 'drawers' of the toolchest, as well as separator lines and label (group heading) lines, where needed. There was an underlying, compiled toolchest-making program on the SGI's that would make the toolchests from those text files --- both SGI-supplied toolchests and user-added toolchests. Unfortunately, there was no such toolchest making program on my PC's --- at least not a program that I could get into and make work how I wanted it to work. 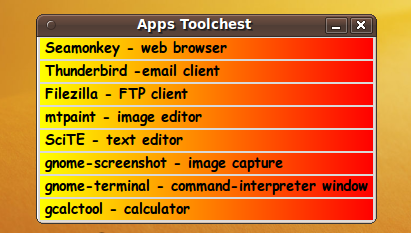 In fact, I had a bad experience with application menus, back around 2005, when using Mandriva Linux with a KDE desktop. I used the KDE menu editor to make some additions to the app menus, but there was a bug in the KDE menu system. Some of my additions would not show. And when I tried to add them again, I got a message saying they were already there. I was caught between a rock and a hard place. I decided then and there that I was going to make my own toolchest making system --- using Tcl-Tk to make the toolchests. I devised a simple format for the text files that would define the toolchests. I just had to make a Tcl-Tk script that would read the lines of the 'chest definition' files and make toolchests. I wasn't sure that it was possible to make a Tk script that would read such a text file and generate a 'toolchest' GUI within a fraction of a second. Let me just say that I was pleasantly surprised. separator lines (made with thin 'frame' widgets). My Tk-button toolchests ended up looking something like this. 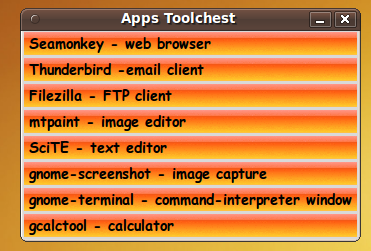 You can see screenshots (and descriptions) of the more feature-rich toolchests of my 'Freedom Environment' (FE) software in the 'feAppMenus' and 'feHandyTools' sections of an FE screenshots gallery page. With the FE toolchests, the user has the ability to change the color scheme in the toolchests via a Tk color selector GUI. You can make that color-selector script by cutting-and-pasting the code from the page offering 'a non-obfuscated color selector GUI', on this site. The color scheme of the toolchests is changed via the 'tk_setPalette' command. In the FE toolchests, the user can also change (or eliminate) the 'bullet' images used on the left of each drawer. This is all nice --- but not nice enough. I am hoping to make more attractive toolchests --- ones that even Steve Jobs would have envied --- by making variations on my Tk-button 'make_chest.tk' script. I was hoping to use the '-compound' parameter of the 'button' command to provide images BEHIND the text on the drawers --- not just the 'bullet' images to the LEFT of the text. But I hit a problem with the '-compound' parameter that is documented in a 'text on image' wish that I posted on the page titled 'Tk 9.0 Wishlist' at wiki.tcl.tk. Since that wish may not be implemented in my lifetime (and perhaps never), I have been experimenting with using the 'canvas' widget to make 'embellished' toolchests. Here are three images corresponding to three basically different techniques that I have tried so far. A description of the basics of each toolchest implementation is under each image. TOOLCHEST/DRAWER DECORATION IS PROVIDED BY: 'create line' commands on the canvas widgets --- to provide COLOR GRADIENT BACKGROUNDS for the 'drawers' ; uses a 'DrawGradient' proc based on Tcl-Tk scripts by B. Oakley and Damon Courtney and published on a page titled 'Drawing Gradients on a Canvas' on wiki.tcl.tk. TOOLCHEST/DRAWER DECORATION IS PROVIDED BY: 'image create' for a background image on the canvas widgets. A rectangular GIF image file is read to make an in-memory image structure with 'image create photo'. That image structure is used in Tk canvas 'image create' statements to put the background on the drawers. To avoid a lot of 'escaping' of special characters (double-quotes, braces, brackets), I ended up loading the text strings for the drawers into an array variable. In a loop over the array argument (drawer count), the canvases are defined-and-packed (with image and text put on each canvas). Also in the loop, the bindings to button1-release are defined. TOOLCHEST/DRAWER DECORATION IS PROVIDED BY: 'image create' for a background image on the one big canvas widget. A rectangular GIF image file is read to make an in-memory image structure with 'image create photo'. That image structure is used in a Tk canvas 'image create' statement to put the background on the ONE canvas widget of this GUI. TOOLCHEST/DRAWER DECORATION IS PROVIDED BY: the 'tk_setPalette' command, with an optional 'bullet' image on the left of each button/drawer, applied with the '-compound left' parameter of the button widget. Since I want to 'give back' to the Tcl-Tk community --- and help out any 'newbies' out there trying to get up to speed in Tcl-Tck programming, here is the code corresponding to the 4 toolchest images above. In the Tk scripts above, I use a Tk coding structure that is discussed in more detail on the page A Canonical Structure for Tk Code --- and variations. Now I have plenty to do in the coming years. 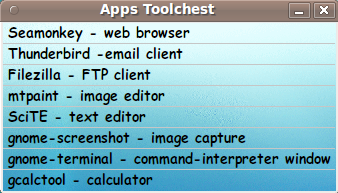 I plan to integrate a couple of these toolchest making techniques into the 'feAppMenus' and 'feHandyTools' (or 'tkGooies') subsystems of my Freedom Environment software at freedomenv.com. Here is an image that shows that the backgrounds of the drawers do not have to be just vertical or horizontal color gradients. The background for these drawers was cropped from a color relief map of east Texas. However, this image also shows that it may not be so easy to find pleasing backgrounds for the drawers. So far, I have found simple color gradients to provide the most pleasing backgrounds. To return to a previously visited web page location, click on the Back button of your web browser a sufficient number of times. OR, use the History-list option of your web browser. The code was created in 2012 --- and posted 2012 Aug 13 at http://wiki.tcl.tk/36780. This FE web page was created 2014 May 14 --- as a backup and alternative to the wiki.tcl.tk page. This page was changed 2015 Oct 05. Page was changed 2019 Feb 27.